The CCP plans to achieve its 2050 goal in two steps. The first stage (2020 ~ 2035) will see China become an innovative country with a “substantial leap” in its “economic, scientific, and technological” strength. The CCP also plans to “more extensively and deeply” influence the world using “cultural means.” The second stage of the plan will take place between 2035 to 2050. The 19th Congress report notes that China’s $12 trillion GDP is the second highest in the world, and China will move towards becoming “a leading country with comprehensive national strength and international influence.” Only by overtaking the United States can China move from the world’s second to the world’s leading economy. The report also states that China’s economy has moved past the “stand up and grow rich” phase, and is now “becoming strong,” a description that maps with China’s current economic situation. The CCP’s core strategy for expanding global power is the Belt and Road (B&R) initiative. B&R will coordinate the CCP’s diplomatic, foreign trade, finance, international influence and ideological output. China’s globalization of the Renminbi (RMB) is the prerequisite for the internationalization of its economic influence and its core global financial strategy. By establishing a land-based and ocean-based trading route, the B&R initiative seeks to project and greatly develop China’s capital, economy, society, technology, and national strength. To draw a comparison, B&R is China’s version of the U.S.’s 19th century cross-country railway construction. The B&R initiative is also China’s roadmap for the internationalization of the RMB. Due to the fundamental difference between the U.S. and China’s credit expansion system, the RMB relies on physical trading and not bond insurance to expand globally. Presently, China’s economy is undergoing transformation and upgrading, and China needs an outlet to export its surplus inventories and production capacity. The B&R initiative will create such an outlet for China. One major constraint of RMB’s internationalization is China’s lack of global outlets and the limited networks of its financial institutions. The internationalization of China’s products will push the internationalization of the RMB and China’s financial institutions. Diplomacy is one of the main tools employed by the CCP to safeguard China’s global trade and financial expansion. To this end, China has held several high-key B&R forums, as well as other initiatives like establishing the Asian Infrastructure Investment Bank and the Silk Road Fund. China also hosted the G-20 Leaders Summit and a meeting of BRICS country leaders in Xiamen Province. The CCP’s call for China to “comprehensively promote big power diplomacy” indicates that it will likely rely on diplomacy to advance its economic ambitions. The CCP cannot guarantee China’s global economic influence by only exporting capital, commodities, and employing diplomacy. So the CCP appears to be advocating another path—China as world leader. The 19th Congress report indicates that the CCP’s domestic and international economic strategies have been connected through the B&R initiative. China is shifting its emphasis from producing in high volume to producing quality goods and services, and its industries are beginning to move up the global value chain. The main industries in China’s next stage of development include advanced manufacturing, web development, Big Data, AI, and deep integration of the real economy. 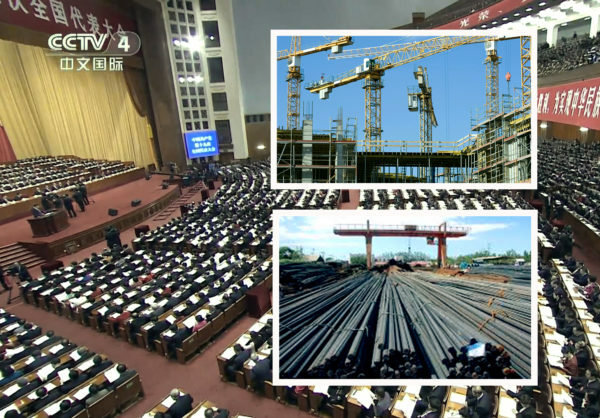 To safeguard industrial development, the CCP will increase its infrastructure network construction, which includes water conservancy, railways, highways, waterways, aviation, pipelines, power grids, information, logistics and other infrastructural work. To shift China’s economic development model from imitation to innovation, the CCP plans to make extensive investments in basic research, engineering, and major scientific and technological projects. The CCP’s goal is to make China a world leader in technology, quality, outer space, cyberspace, and transportation. Also, the CCP wants to build a digitized and “smart” society. The chief concern of China’s agricultural sector is land ownership. According to the 19th Congress report, the CCP is prepared to extend land contracts to Chinese farmers for another 30 years in order to maintain self-sufficient grain production. Given China’s rapidly aging population and the movement of rural youth to urban cities, the CCP will find it very challenging to achieve food self-sufficiency. China’s regional economic development is progressing more rapidly in the southeast coastal areas, and much slower in the west, central, and old industrial northeast regions. The CCP frequently hyped its regional coordinated development strategy, but its real effects are yet to be observed. The planning and construction of Hebei Province’s Xiong’an New Area, however, is noteworthy. The CCP hopes that the regional coordinated development of Beijing, Tianjin, and Hebei (a region with a combined GDP of over $1.1 trillion) will see good returns. In sum, the 19th Congress report reveals his intentions to make China a world economic leader by 2050, and the CCP’s domestic and international economic strategies will be developed in support of this goal. Contact us for in-depth analysis of China’s economic policies and directions.